Tehran is the first chapter of 15-year-old Siamak’s life; a housing estate in a Nordic country is the second. Siamak was named after his uncle, who died as a martyr in Iran – a man impossible to live up to. Northern Europe is now his home: Siamak loves snow and being out on the ice hockey rink more than anything else. Atisha, their neighbour’s daughter from Iran, moves in with his family. She’s had to flee the country because her blog was banned. Atisha has never seen snow, but she knows the fairy tale about the Snow Queen, whose kisses cause her victims to freeze and make them forget where they came from. Atisha wants Siamak to remember his roots. Snow is a touching story about the children of immigrants, who walk a tightrope between their heritage and new homeland as they carry the responsibility for interpreting their new homeland to their families and grow up with a different nationality than their parents. 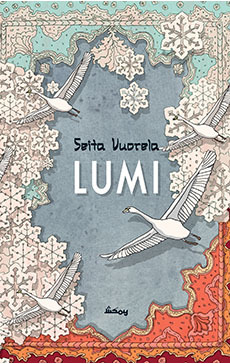 SEITA VUORELA (1971–2015) a much loved, internationally respected YA author whose works have been translated into nine languages. Her previous novel, The Reef (‘Karikko’, 2013), was awarded the Nordic Council Children and Young People’s Literature Prize and the Finnish Literary Export Prize. Her most widely translated novel, School of Possibilities (‘Viima’, 2016), was awarded the Pépite du roman ado européen prize in 2011 as the best European YA novel published in France that year.